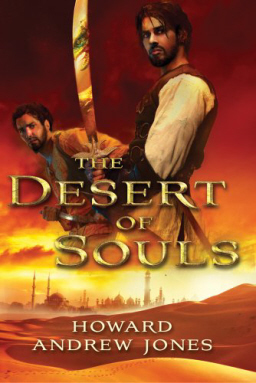 St. Martin’s Griffin re-released Howard’s The Desert of Souls as an attractive trade paperback last week. A new release means additional chances to capture attention and generate buzz, so I was pleased to spot a new review at SF Signal this week. Desert of Souls is the debut novel from Howard Andrew Jones. Howard Andrew Jones knows sword and sorcery… Jones is also the managing editor of Black Gate, a magazine devoted to adventure fiction, swashbuckling fun with brisk pacing and high imaginative action. So, does Jones practice what he preaches in his debut novel, The Desert of Souls? You bet! … Dabir and Asim are swept into a tale right out of the Arabian Nights that takes them from the streets of Baghdad to the titular Desert of Souls. In addition to entertaining action that never flags — Jones seems to have taken Van Vogt’s dictum about throwing a changeup at every turn to heart — the novel’s strength is the relationship between scholar Dabir and guard captain Asim… I enjoyed this book immensely. It had me constantly invoking the opening theme song of Aladdin in my head, and the action and adventure kept me turning the pages to find out what was going to happen next. I would be extremely interested in finding out what else Dabir and Asim get up to after the events of The Desert of Souls. If Paul were a regular Black Gate reader, he’d know that Dabir & Asim will return this August to face shape-changing assassins, a treacherous Greek necromancer, a dangerous cabal seeking ancient magical tools of tremendous power, and a vengeful spirit intent on sheathing the world in ice for a thousand years, in The Bones of the Old Ones. Life is good. You can read Paul’s complete review here. Great book, but I liked the HB cover better. Life is, indeed, good. Vengeful spirits! ICE! Yes!